Let’s “Start” exploring. If you recently upgraded from Windows 7 or 8 or purchased a new Windows 10 computer, the following tips can help in navigating the various parts of Windows 10. On the bottom left-hand corner of your screen is the 4 pane white Windows Start icon which is probably similar if not identical to the Windows icon on your keyboard. If you click on that icon, tap that icon on your touchscreen or touch the Windows key on your keyboard, you’ll open up the Start menu. When you click on All apps you’ll see a list of apps on the left side. Windows 8 users will notice the familiar Live Tiles to the right. 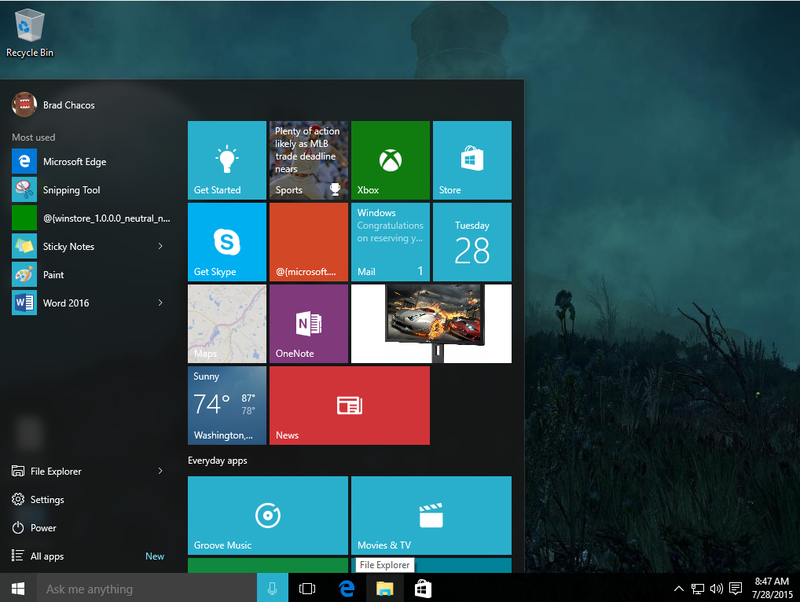 Some of those Live Tiles may already be flipping over to show you relevant information. For now, though, let’s start on the left. Scroll down to “G” and click “Get Started” which is a good resource if you’re looking for some orientation to Windows 10. You can arrange and rearrange tiles as you’d like. Try right-clicking on one, and adjusting the size. If you can’t enlarge it, try dragging and dropping it to an open space. Some tiles don’t like to be re sized as they will stop responding if they are too large. Maybe you’d like the Mail application or your Calendar in the top left-hand corner. Just hold down the left mouse key and drag it to where you want. You should be able to pin any app to your Live Tiles menu including those found in the left-hand All apps list. Not all will function as Live Tiles, however, that’s up to the app designers. Some tiles can be deleted, others can not. Right clicking an unwanted tile will allow you to click on “Uninstall” or turn it off by moving to “More” and clicking “Turn live tile off”. Now, scroll down to Settings, and click there. Some people get a little nervous about tampering with the Settings. Don’t worry, in Windows 10, Settings are more like your car’s dashboard. Click “Update & Security” then click “Check for updates” or “Install” if you have updates waiting for you. There is one more thing that you need to be familiar with before we’re done and that is finding where Internet Explorer is hidden. Microsoft wants you to use it’s new Edge browser that is represented by a bright blue stylized “e” located on the task bar. I feel Edge is awkward and unintuitive to configure and use. Google’s Chrome is the browser to download and install for the best security. However, Internet Explorer has its followers so here’s how to find it. Click “All apps”, click “Windows accessories”, right click “Internet Explorer”, move to “More” and choose “Pin to taskbar”. The PC Club meets on the 3rd Tuesday at 7 PM of each month at the Community Center. Bring your questions and we’ll show you how to get started on Windows 10.